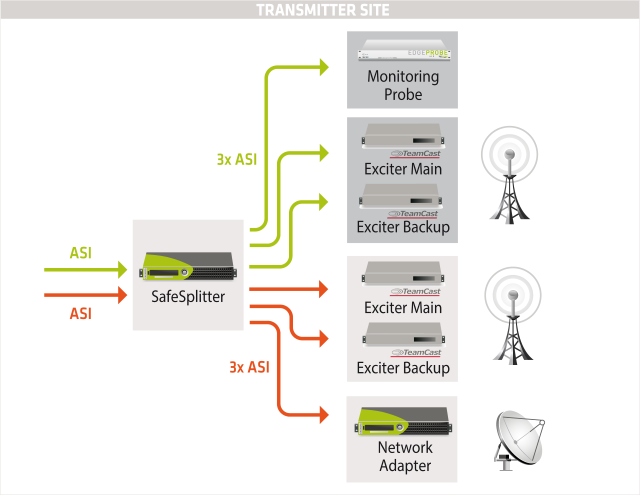 SafeSplitter is a dual-channel 1:3 ASI splitter, with two independent splitters in one unit. Each channel splits one ASI input into 3 ASI outputs, typically to generate multiple outputs of the same MPEG-2 transport stream. Advanced Transport Stream Analysis feature is embedded, allowing to monitor and provide comprehensive analysis of the input TS signals. Additionally to the duplication, SafeSplitter provides advanced independent monitoring of each input MPEG-2 transport streams. SafeSplitter can detect errors and generate alarms based on ETR290, T2-MI or advanced MPEG-2 TS errors. In case of power failure, SafeSplitter maintains service continuity with passive bypass. Therefore, one output of the input MPEG-2 TS is maintained regardless of power supply failure. 444 mm / 17.48 in. 274 mm / 10.79 in.